Many of our customers pick PermaBilt® because of our heritage having been in the post frame business since 1973. Having constructed over 20,000 buildings—or in other words, 21 million square feet built—customers feel confident that PermaBilt® can construct their building of choice. As was the case with our Snohomish Washington customer, who looked to our expertise in building an RV storage and garage with the quality and craftsmanship that is expected after so many years in the post frame business. 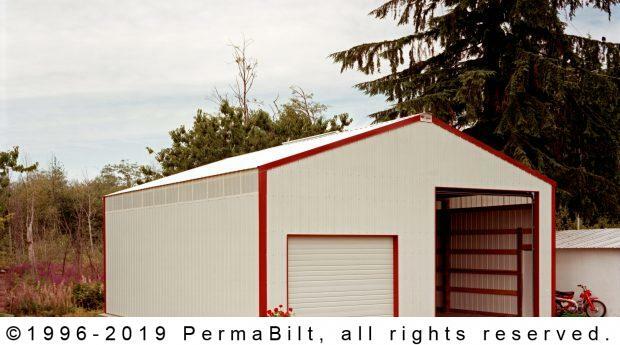 Simple in design and no bigger than his property would allow, he met with our PermaBilt® Building Representative in putting all the details together. This design was ideal for his need to house his RV and a car. Two garage doors in the front and an entry door on the side as well as eave-lights along one eave and a 10’ continuous flow ridge ventilator fit the customer’s needs to a T.
After completion, our Snohomish customer could see first hand the quality and craftsmanship that he had paid for. He was happy.